Did you know: If you shrunk the size of your dinner plate just 2″, you could lose 18lbs in one year? You may have already heard of the Small Plate Movement started by Dr. Brian Wansink at Cornell University to help promote healthier eating habits. The focal point of the movement is to get people eating on smaller plate sizes. 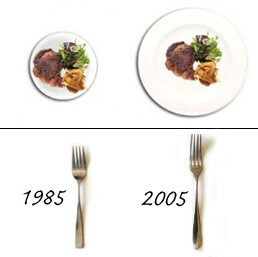 Traditional plate sizes have only gotten bigger over the years (almost 2″ more than what your grandma probably had). Wansink and his team propose eating on a plate 9-10″ to reduce calorie intake and over-eating. And they say just by doing this small act alone, a person can lose a significant amount of weight. Which led me to considering: what if we applied the small plate principle to our personal finances? Here’s a few ways we can apply this principle – especially for those who are struggling to make changes in your financial world. Trim your bank accounts. Here’s one thing that has really made the difference in our spending: once we get paid, I shrink our bank account. When you don’t have that big plate to eat off with all that food – you eat less. And, when that bank account isn’t stuffed full of funds, you’ll likely spend less. Toss a percentage of your income to savings. The best option is to put ‘er into an account you don’t have immediate access to. Shrink your wallet. When I have cash in the pockets or wallet, I tend to spend it pretty quickly. Even having numerous credit cards gives me more inclination to spend. So, I typically carry very little, to no cash and only two credit cards for emergencies or large purchases (where I might be able to rack up some quick cash rewards). Home size. One of the ways we consume too much in our finances is to buy too much house. And this has not been easy to avoid when you’ve had lenders and mortgage brokers willing to max you out. With housing being the bulk of most our expenses, making sure you don’t eat too much, is vitally important to maintaining a healthy financial future. And with a smaller home – you don’t need as much stuff to fill it. Cut the crap. The more stuff I have – the more I tend to spend. One of my goals since starting a more thrifty way of living is to “cut the crap” out of life. Minimalism is truly the way to go. Less stuff = less headaches and money out the window. Certainly these aren’t the only ways to portion-size our finances. Can you add any other to the mix? Shrinking your bank account is great. I’ve noticed that I’ve gotten good at just accepting that money in my emergency fund, retirement and stock accounts are just GONE. The only bank account balance that I check out really is my checking account. It’s what I compare my credit card statement too and base new purchases off of because once that money transfers anywhere else, it does not see the checking account again. If my credit card balance is creeping too high, then I just need to wait, because that is definitely not something I’m going to touch my savings accounts over. I’d never thought of it in relation to that plate study though. Heck, actually trimming down the plate to that size would probably effect our wallet as much as our waist since we’d be saving on food too. A large living room and high ceilings are great, but the cost to maintain and comfortably live in such a home is pretty pricey beyond the cost of mortgage payments. For example, a smaller home is cheaper to heat in the winter and cool during the summer. I love the tip about trimming your bank account too. Right when Rick gets paid, we lop off a chunk and put it into savings, and it really feels like it doesn’t exist. It’s a pain free way to save, because if the money were in the checking account, we would’ve definitely found something to spend it on, needed or not. Great tips Aaron. I am a HUGE fan of trimming your checking account. The second I have more money in there than I need, I transfer a chunk to savings. I then forget about the money and am much less likely to spend it on stuff I don’t need. It really is true that you don’t miss what you can’t see. Great tips! I especially like the “cut the crap” one, which is something I am trying very hard to do! Smaller home size is crucial to smaller portions. The bigger the house, the more “stuff” you need to fill it. I recall my first encounter with a broker – and they qualified me for a ridiculous amount.. of course, 5 years later, we all were paying for it via the Recession. Eating in small portions seems more logical than following fad diets, and I agree that the same idea can be applied to personal finances too. I personally follow the 2nd idea of not keeping enough cash in one’s wallet when shopping. If I ever end up having more money than is safe to walk around town with, I simply take some out and leave it at home, and end up only buying things that are truly necessary. Plus, I avoid credit/debit cards so I only use the cash I have.